I have been working at the craft of writing for over thirty years. In that time, I have probably written a million words. You would think, someone who possessed my passion for phrasing would find it easy to express her thoughts. That is not always the case. Recently, I tried to use my words to express a tornado of thoughts swirling around in my brain, but they came out all wrong and someone I truly love was hurt. Despite appearances to the contrary, I am an "in the head" kind of person, always thinking, analyzing, over-analyzing. So it was only natural that I sit and ponder the cause of my verbal devastation. I concluded that fear was the cause. F-E-A-R. A nasty four letter word that keeps people from achieving, obtaining, expressing. The problem with being a wordsmith is that sometimes I reach into my bag and pull out more than I need. I have a tendency toward verbosity. An unfortunate trait I am attempting to master through the careful study of the works of Ernest Hemingway. I was never a Hemingway fan. The whole suicide thing just freaked me out. I couldn't read his works without visualizing his demise (I told you I am an in-the-head kinda gal, didn't I?). It's the same thing with Vincent Van Gogh. 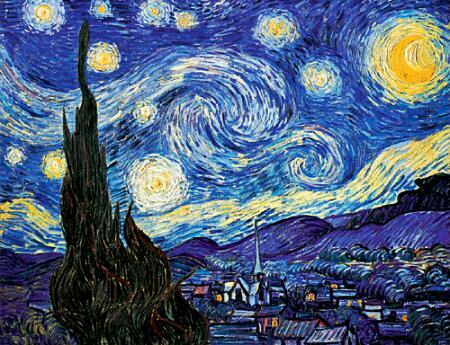 I look at his Starry Night and see madness in the swirls. And it makes me sad. Someone I respect recommended I read Hemingway and so I did. I looked beyond the madness and found the genius. Hemingway was not a fan of using two words when one would do. I wish I had remembered that before I spoke the other day. I wish I had thought to keep it simple. I wish I had just said, "I love you." Three tiny words that can be difficult to say when you have a thousand other words swirling around in your brain. Wouldn't things just be easier if we kept it to I love you? You are such a kind, supportive critic and friend. I don't always express myself clearly when I am overwhelmed with emotions, as was the case the other day. As far as things turning out okay, time will tell. I am just pleased that I was able to boil all my thoughts down to one, potent and true statement. Ah, but mon cher ami, we both know I am not a simple person! :) I have a few Hemingway novels on my KindleFire and iPhone. Perhaps we could listen to A Moveable Feast while touring the South of France. Serait-ce que vous aimez qui?